Mobile communications beyond 3G will integrate different (but complementary) access technologies into a common platform to deliver value-added services and multimedia content in an optimum way. However, the numerous possible configurations of mobile networks complicated the dynamic deployment of mobile applications. Therefore, research is intensely seeking a service provisioning framework that is technology-independent, supports multiple wireless network technologies, and can interwork high-level service management tasks to network management operations. This paper presents an open value chain paradigm, a model for downloadable applications and a mediating platform for service provisioning in beyond 3G mobile settings. 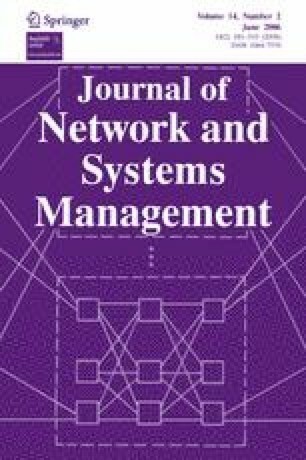 Furthermore, we introduce mechanisms that support a coupled interaction between service deployment and network configuration operations, focusing on the dynamic provisioning of QoS state to data path devices according to the requirements of dynamically downloadable mobile value-added services (VAS). The intelligent network and service provisioning architecture described here has been developed and implemented as part of the EU-funded MOBIVAS (Mobile Value-Added Services) IST project. The authors extend their special thanks to all their partners in the project for their continuous support and stimulating discussions throughout the project. Vangelis Gazis received his B.Sc. and M.Sc. (Communication Networking) degrees from the Department of Informatics & Telecommunications at the University of Athens, Greece, in 1995, and 1998, respectively, and his M.B.A. from the Athens University of Economics and Business in 2001. He is a member of the Communication Networks Laboratory R&D group at University of Athens and has participated in Greek and European R&D projects (IST-MOBIVAS, IST-ANWIRE). Nancy Alonistioti has a B.Sc. degree and a Ph.D. degree in Informatics and Telecommunications (University of Athens). She has participated in national projects (CTS, SS#7, ACTS RAINBOW, EURESCOM) and provided technical leadership in European IST projects (MOBIVAS, ANWIRE, E2R, LIAISON). She is co-editor and author of “Software defined radio, Architectures, Systems and Functions,” published by John Wiley in May 2003. She has served as TPC member in major conferences in wireless mobile communications and has over 55 publications in the area of mobile communications and reconfigurable systems and networks. Nikos Houssos received a B.Sc. and a Ph.D. degree from the Department of Informatics at the University of Athens (UoA) and an M.Sc. in Telematics (Communications & Software) from the department of Electronic Engineering, University of Surrey, UK. In 1999, he joined the Communication Networks Laboratory (CNL) staff at UoA and participated in European IST R&D projects. He has served as a visiting professor at the Electronic and Computer Engineering Department of the Technical University of Crete and focuses on middleware platforms and business models for mobile service provision, service adaptability, network reconfigurability and pervasive computing. Maria Koutsopoulou received her diploma with distinction (ranked first in her class) in Electrical Engineering from the Demokritos University of Thrace in 1996 and her Ph.D. degree in Informatics and Telecommunications from the University of Athens (UoA) in 2005. Since 1999, she has been with the Communication Networks Laboratory (CNL) in the Department of Informatics and Telecommunications (UoA) and has participated in European and national projects (LIAISON, ANWIRE, MOBIVAS, etc). Her research focuses on charging, billing and accounting for mobile, IP and reconfigurable networks, and, business models in 3G & 4G mobile networks. Stefan Gessler received his MSc in Computer Science from the University of Karlsruhe (Germany) in 1992 and joined the Institute for Telematics (Telecooperation Office) at the U Karlsruhe in 1993 as a research assistant. He has participated in R&D projects initiated by the German Telekom and DEC in relationship to the BERKOM and his research interests include mobile access to global information systems and integration of PDA and penboard in office work. He is currently with NEC Network Laboratories in Heidelberg, Germany, and has participated in EU IST FP5 & FP6 research projects. Juergen Quittek manages a research group at the NEC Network Laboratories in Heidelberg, Germany, working in the areas of network management, traffic measurement and IP signaling. He co-chairs the IETF working group on packet sampling (PSAMP) and is a major contributor to the IETF working group on IP flow information export (IPFIX). He was visiting professor at Freie University of Berlin and gave several tutorials at international conferences. He has also participated in numerous EU IST R&D projects (MOBIVAS, etc).